Blending traditional Mewar style with modern luxury, the Kohinoor Suite with Private Pool at The Oberoi Udaivilas is lavish and spacious suite with a private pool and 24-hour butler service. Guests arrive through a sunlit outer courtyard and chandelier-lit inner courtyard. 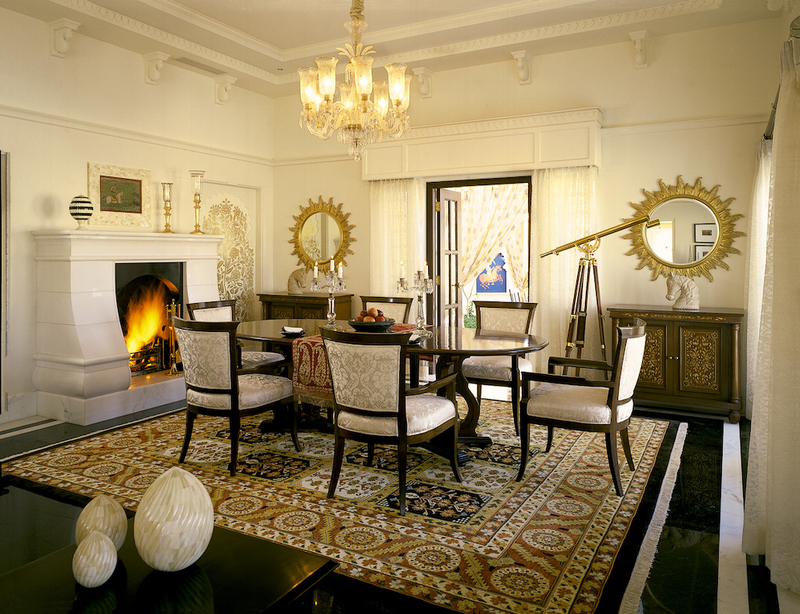 Once inside, there are domed ceilings, hand carved marble privacy screens, and mirror mosaics. Within the space, there is an opulent master bedroom, twin bedroom, dining room, and living room. The bedrooms have pillowtop mattresses, along with blackout curtains, and pillow menus. The ensuite bathroom has a separate shower with massage settings, standalone claw-footed bathtub, TV volume controls, and natural toiletries created exclusively for Oberoi Hotels. Throughout the suite, there are Frangipani trees, miniature wall pantings, an espresso machine, three 42-inch flat-screen TVs, and five telephones. Continue reading below the photo. Plus, the suite's private, outdoor, temperature-controlled pool is framed by sun loungers, recessed sofa seating, and an outdoor dining space. Read more below. 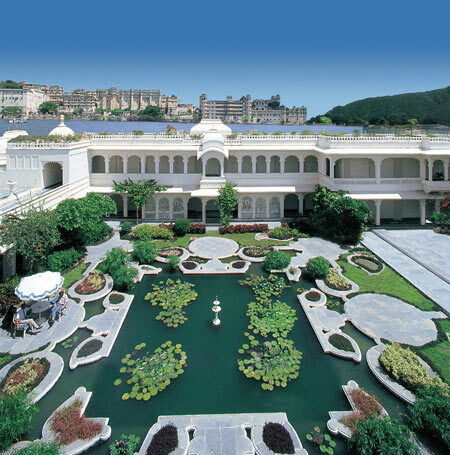 The Oberoi Udaivilas overlooks Udaipur's Lake Pichola and the Udaipur City Palace. 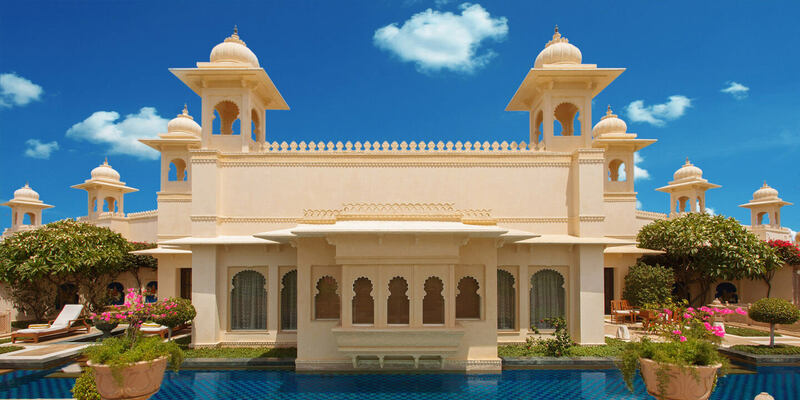 Surrounded by 30 acres of gardens, fountains, and pavilions, the property is styled like a Rajasthani Palace. Standing on the 200-year-old hunting grounds of Maharana of Mewar, there is a wildlife sanctuary with deer and wild boar. The luxury hotel has the Oberoi Spa with Ayurveda inspired, Eastern, Western, and signature Oberoi treatments, plus morning yoga, outdoor pools, and fine dining options at indoor and al fresco restaurants. Read more below the photo. Guests have the opportunity to partake in exclusive Oberoi experiences such as city tours by boat, traditional Thekri workshops, miniature painting classes, henna painting, safa tying, heritage walks, maharaja rides, pottery classes, cooking and bartending lessons. palace may be the most romantic hotel in the world. 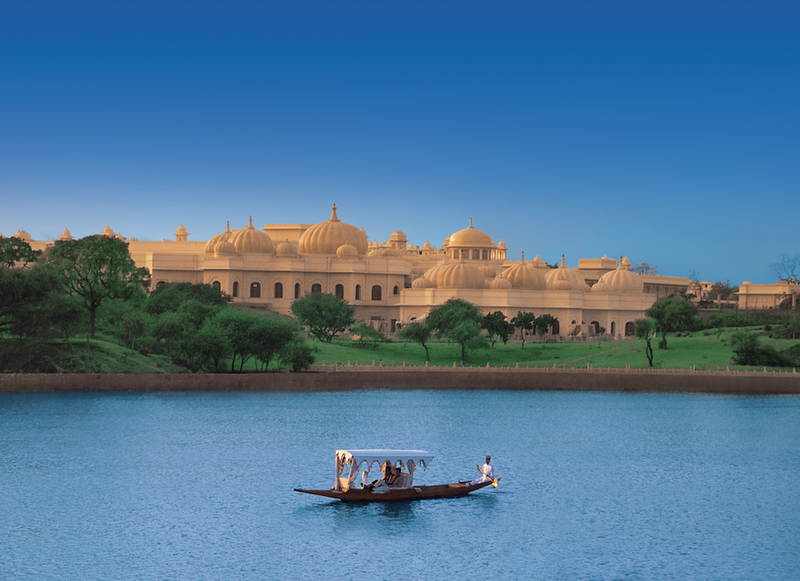 The Oberoi Udaivilas is accessible by an enchanting boat ride across Lake Pichola. Taj Lake Palace wasn't always a luxury hotel. Legend has it that young prince Maharana Jagat Singh II indulged in moonlight picnics with the ladies of the Zenana on the lake island palace of Jag Mandir. Then his dad found out. With that option closed to him, the prince built his own pleasure palace on a different island in Lake Pichola. Begun in 1743 and inaugurated in 1746, the new palace was named Jag Niwas after his highness Maharana Jagat Singh II, 62nd successor to the royal dynasty of Mewar. Jag Niwas, now Taj Lake Palace, is one of four islands in Lake Pichola. The Taj Lake Palace has long been in our category of super luxury, and it's certainly one of the most beautiful hotels in our collection. And now, it's getting some celebrity recognition, thanks to hotshot designer Diane von Furstenberg. She recently stayed at the hotel and declared it possibly the 'best hotel in the world.' A woman with an eye for fashion, her approval certainly counts a little more than the average bear's. While the superlative might be a bit hyperbolic and a few other hotels give it a run for its money, I can't imagine experiencing anything less than the sublime at the Taj Lake Palace. The white marble palace seems to be suspended above the waters of the surrounding lake, where the Maharana lived and entertained at his summer palace. Ceremonial barges and private dinner-pontoons promise to whisk you away to a land of enchantment, and the breathtaking gardens and lily ponds are the perfect setting for romance. If you can't trust me, then take the word of Diane von Furstenberg, and stay at the Taj Lake Palace in Udaipur. Posted in: Asia, India, Udaipur, Hot Spots, Luxury Suites, What a Hotel!